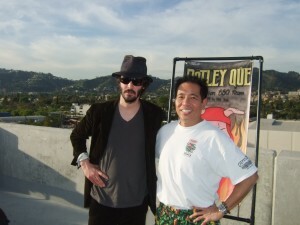 My BBQ buddy Gary Notley partnered with me to do a Hollywood catering gig for Matt Dubin’s 40th birthday and a hundred guests including Keanu Reeves, star in my favorite movie series the Matrix trilogy. 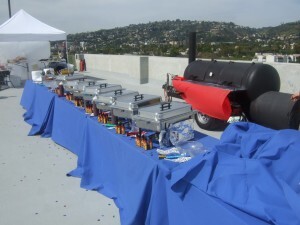 It was a picture perfect sunny California day and we set up a BBQ buffet line on the top floor parking structure of a old Warner Brothers studio called The Lot. 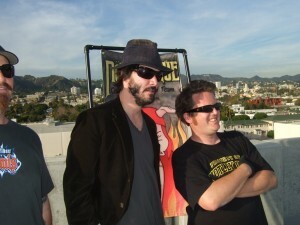 We had a great view of the Hollywood sign on one side and downtown LA on the other. Gary handled all the BBQ meats like ribs, pork, and brisket, and I made six sides including my special BBQ spaghetti with Smoked Tri-Tip and Andouille Sausage and scratch-made cornbread (see menu). 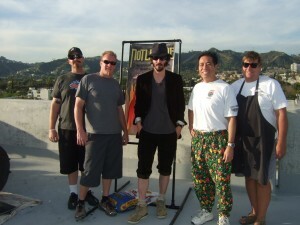 During the menu planning stage, I suggested to Gary that we do a vegeterian items since we were serving a Hollywood crowd. That turned out to be a great idea as the BBQ Organic Tofu Salad was a big hit. Chris Rocke, one of our BBQ brothers on the competition circuit also came along with his very cool looking smoker to lend an authentic BBQ “show and smell” to the show. Che and Mike rounded out the 5-person catering team and come along to help out. 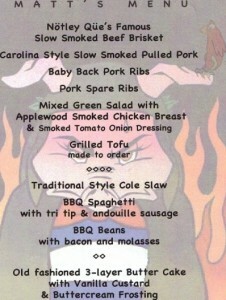 There was a steady stream of guests from about 1 pm through the day and everyone loved the BBQ feast and sides. They would come by the buffet line to eat, relax and play ping pong and sandbag toss, and then return for more food. Gary had won two back-to-back Brisket Championships last year and his brisket amazed the crowd so much that even the vegeterians were eating his brisket! I received rave reviews for the BBQ Organic Tofu salad with mixed greens and a special smoked Tomato Onion Dressing which I invented after toying around with various ingredients in the weeks leading up to this anticipated event.